We know that you trust us with your personal information, and we take the privacy of our customers seriously. Your personal information is used for internal purposes, such as confirming and tracking your order, analyzing trends and statistics, informing you of our new products, services and offers, and providing you with information from and about Mason Row. 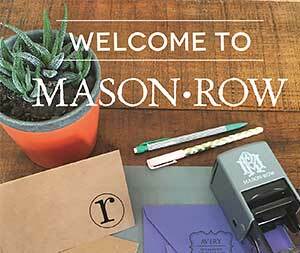 Email: When you sign up to receive emails from Mason Row we send regular communication regarding new merchandise, events, or other Mason Row news. Your e-mail address is never shared or sold to third parties. To opt out: To remove yourself from our email list, please notify our customer service team via e-mail or remove yourself directly from the Constant Contact e-mail we sent you. In addition, Mason Row does not store credit card number information. When ordering online, this information is sent directly to the authorizing banks and cannot be seen or retrieved by any of the Mason Row personnel.